Xavier Flynn is an assassin for the British Counter-Espionage Department. Thirty-six years of age at the time the major events of the series begin, he was recruited as a young man of twenty-one while performing his national service with the Fusiliers in Malaya. When the Department decided an assassin was needed, at the top of the list was the name of Flynn due to his willingness to kill on command. Flynn was not one to ask too many questions when given an order. This made him the first choice for the new position. Though other agents would also be hired for this lethal section, Flynn remained the best and most feared. Flynn is described as a man who greatly loves wine, women, and song and partakes of each liberally and often. He is also a devout Catholic who routinely seeks Confession and tries to atone for his sinning. Most of all, Flynn thinks of himself as a solid member of the working class and is a man who leaves the decision-making to others. On the one hand he is a party animal. On the other, he is a man concerned with his soul. And he is always a man who is willing to kill at the drop of a hat working for an organization that has decided there are some enemies of the state just best eliminated. Leading the enemies list is an organization called FIST, Fear Insurrection Sabotage and Terror, dedicated to the destruction of all free societies to put order back into the world. 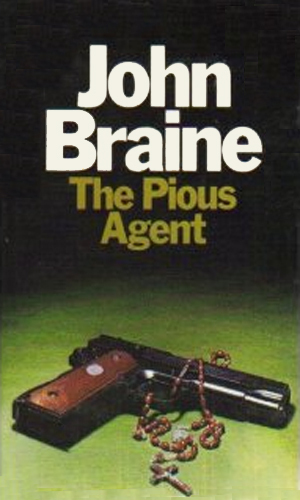 Interestingly, while the two books in this series didn't come around until the mid 70s, the Angry Young Men style of writing that the author help introduce twenty years before probably had an effect of spy writers to come later. Instead of agents who were upper crust and went to the best schools, these new spies were from common beginnings and often didn't trust the bosses. 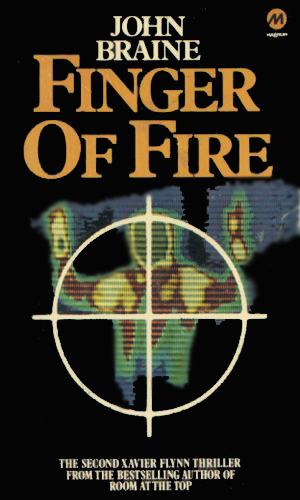 A job to eliminate a Soviet agent gets complicated and Xavier Flynn finds himself in a search for a mole in the leadership of the British government, a man working for FIST and dedicated to England's fall. FIST has taken possession of a powerful laser weapon, capable of wholesale destruction. Set up in America, it is pointed at Britain and will start wrecking havoc if Xavier Flynn can't get to and eliminate its members. Irreverence is the keyword to this series. Flynn is a decent man who does indecent things. He is a true believer in his religion who is willing to break one of its strongest commandments for the protection of his country. And his story is told with an ease that borders on light-hearted without actually crossing that line. I wasn't sure what to make of this series when I first learned of it but once I started, I knew it was going to be good. It was after reading the first book that I learned more about the author, giving extra value to the reading of the second. Then I began to wonder whether Flynn carried out his missions so matter-of-factly because he didn't care one way or the other or because following orders from the aristocrats was what those of his station did. Or I might just be reading too much into them.